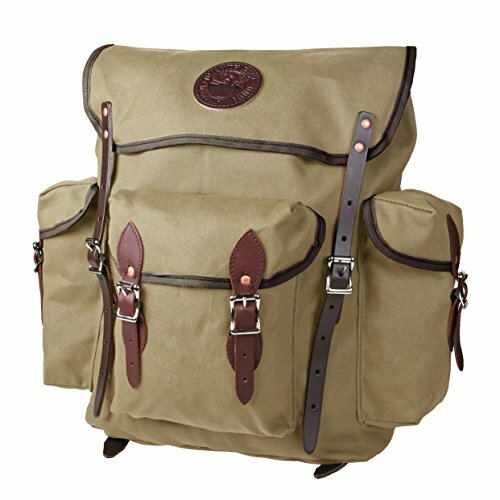 We took our immensely popular Rambler Pack and scaled it down. In the process we created a super functional day pack with European flair. A roomy, top-loading compartment cInch shut with a drawcord. Topflap secures with two leather straps and roller buckles. Side pockets are spacious enough for a quart water bottle. Need easy access to your binoculars, point-and-shoot camera, wallet, keys, sunscreen or bug dope? Simply unbuckle the handy front pocket. (All this stuff actually fits in the front pocket!) Web shoulder straps. An ideal medium-sized pack for any day trip, whether its hiking, biking, canoeing, or wandering the streets of Europe. Features include a roomy buckle-down front pocket, buckle-down side pockets and rugged leather straps and roller buckles. Constructed of 15-ounce canvas with cotton webbing shoulder straps. Also available in Waxed Canvas. Made in USA.